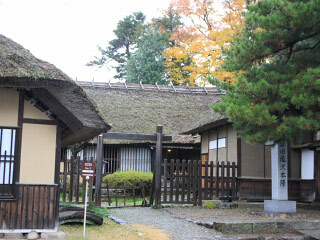 Takizawa Honjin (旧滝沢本陣) is one of is one of remaining Samurai House in Aizu. It was used to be a hotel for Daimyo in Edo period. The building was constructed in 1678 as resting place for Daimyo. It is registered as national historic site and important cultural asset. In Boshin War, Byakko tai went into battle from here. There are many damage and scratches by bullets and Katana. Admission: 300 yen for adult, 250 yen for high school, 150 yen Junior, 100 yen for kids. 0. at Aizu Wakamatsu Station. 1. use a local bus to Imoriyama. Takizawa Honjin is one of historic site of Aizu, Fukushima Prefecture. It was used for the resting house for Daimyo during Daimyo parade. It is located near Wakamatsu castle. So, Daimyo used this house to change his official outfit before entering the castle or traveling to east. It was constructed in 1678 and registered as national important caltural asset. This is the oldest remaining house built in Tohoku region. During Boshin War, it was used for the headquarter of Aizu army and the famou teenage Samurai team, Byakko tai went into battle from this house. It was attacked by the new government army. There are many damages and scratches by bullets and Katana.